The normal range of human hearing extends from about 0 dB to about 140 dB. The level of 0 dB is the threshold of hearing, which corresponds to sound pressure level of 20 µPa, the minimum detectable sound pressure level by average human ear. A 10 dB increase in the level of a continuous noise represents a perceived doubling of loudness; a 5 dB increase is a readily noticeable change, while a 3 dB increase is barely noticeable to most people. Sound levels above 85 dB are considered harmful, while 120 dB is unsafe and 150 dB causes physical damage to the human body. Windows break at about 163 dB. 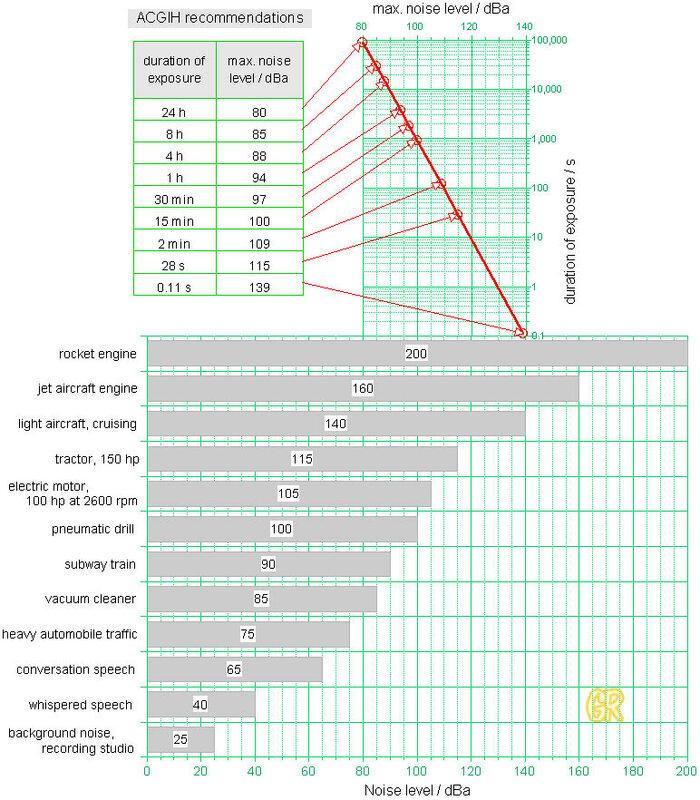 Jet airplanes cause about 133 dBa at 33 m, or 100 dBa at 170 m distance. Eardrums rupture at 190 dB to 198 dB. Shock waves and sonic booms cause levels of about 200 dB at 330 m. Sound levels of around 200 dB can cause death to humans and are generated near bomb explosions (e.g. 23 kg of TNT detonated 3 m away). The Space Shuttle generates levels of around 215 dB (or about 175 dBa) at 17 m.